Let me give you a little background. 2011 was a tough year working through loss (some difficult things happened at work and three of our best friends moved on). 2012 was a year full of ups and downs with our adoption journey. As you can see, both the ideas of “celebrate” and “give thanks” turned out to be interesting challenges to act on; contrary to our circumstances. To celebrate even when it felt painful; to give thanks even when we weren’t getting what we wanted. 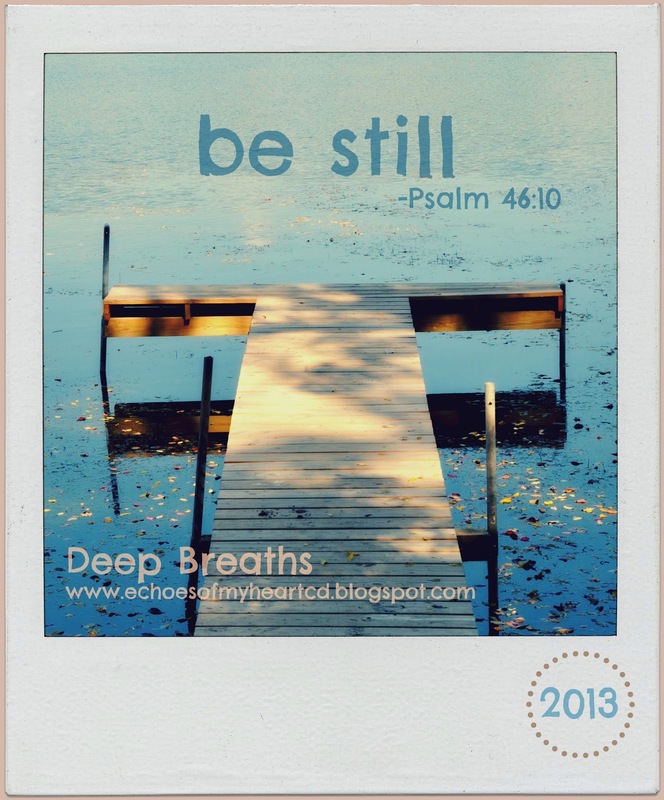 So, I am wondering…maybe 2013 will be one full of action and the challenge will be to be still (be at rest and peace, trusting in His steadfastness) in the midst of it all…we will see! Now, don’t get me wrong, I believe that God wires us each in various ways for specific purposes, but my hubby has a warranted pet peeve; when people excuse, brush off, or dismiss sinful/wrong behavior as their personality- like they can’t help it. So, the power of the Holy Spirit and balance are needed to address personality strengths and weaknesses. In other words, my type A tendencies can be used for good (like assertiveness and the drive to improve), but they can also be hindrances as well. So, when I started unpacking “be still” today, I began to see what God might be trying to put His finger on in my life. Please take a moment and read these two commentaries on Psalm 46:10, specifically on the area of meekness. What stuck out to me here was “that disposition of spirit in which we accept His [God’s] dealings with us as good and therefore without disputing or resisting….wholly relying on God rather than their own strength to defend against injustice…gentleness and meekness is the opposite of self-assertiveness or self-interest [ouch]! So, we will see how God uses this idea of be still to refine me. It will be interesting to revisit this topic throughout the year and see what is specifically being learned. I desire to be a woman who does not control, but is at rest in God’s Presence and ability (sufficiency) to direct my life and the lives of those around me. Control is a huge issue I wrestle with and asking Him to grow me in this area [of not striving, but resting and trusting, and being at rest internally] is going to be challenging, but I long to change and be refined; for my health, for the benefit of my family, and mostly for His glory. Deep Breaths: Consider visiting One Word today and joining this journey of growth and adventure in the New Year. I would love to hear what your word is, why you chose it, and how you hope to grow through it.